16th February 1945 - commission transferred to RNAS Middle Wallop. 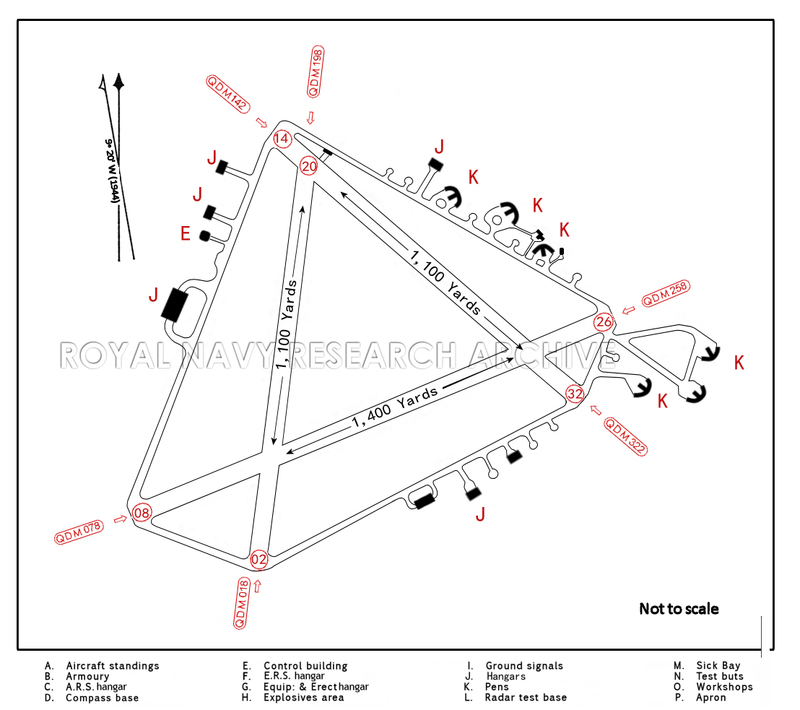 The airfield is situated 4 miles from the coast, 11 miles NE of Norwich, and 9½ mile NW. of Great Yarmouth. half a mile west of Ludham village, in Norfolk, East Anglia. The village of Ludham lies 1 miles SE. Great Yarmouth and the East Coast Airfield lies central between Barton Broad 1 mile NW, and Hickling Broad 1 mile NE and river Thurne i mile SE. Roads to Norwich (15 miles) and Great YArmouth (13 miles). Personnel to be sent to Wroxham station L.N.E.R. via Norwich (8½ miles by road). Goods to Potter Heigham, Midland and Great Northern Joint Railway, (2½ miles by road). Not open for flying while in use by RN. Control building and meteorological office on NW. side of landing area, outside the perimeter track. 08/26 QDM. 078˚-258˚.... 1,400 x 50 yds. 02/20 QDM. 018˚-198˚ .... 1,100 x 50 yds. 14/32 QDM. 142˚-322˚ .... 1,100 x 50 yds. A 40-ft. perimeter track connects all runways, pens and hangars. None. Not open for flying while in use by RN. 12 x pens, 9 x hardstandings, 18 single & 17 double U.S.A.A.F. type hardstandings (pierced steel). Sick Bay in camp site about 1,000 yds. W.
There are no training facilities, workshops or accommodation for squadrons except those provided by the M.O.N.A.B's forming on the airfield. Operational flying commenced at on November 20th 1941 when the station opened as a grass satellite airfield for RAF Coltishall and forward base for fighter command. The Spitfires of 152 squadron making daily use of the airfield. It was to be used by many RAF squadrons over next three years but none were to stay for very long. The station was closed to flying operations in July 1943 and work commenced to build three concrete runways, taxi tracks and aircraft hard standing to prepare the station for its next intended occupants, the U.S. Eighth Air Force, however they never took up the option of using Ludham for operational duties. The upgrade work was to take a year, after which time the station remained empty of all but its maintenance complement until August 1944. Although not an operational station in its own right, Ludham was opened by a skeleton duty crew to provide emergency recovery facilities for American bombers returning from raids on the continent; Ludham being the first airfield on the flight path home to Norfolk. In total 8 B17s, 1 B24, 1 P47, & 1 P48 aircraft did have to either crash or make emergency landings at Ludham or in the surrounding area. At the same time as the works programme at Ludham was completed the Admiralty were urgently seeking a suitable station to house the newly formed Mobile Naval Airfields Organisation (M.N.A.O.). Although the organisation had been in existence since September 1943 it was not established at a central location, its various departments were housed in the Admiralty while the planning and organisation were carried out. Initially the location of this H.Q. was to be overseas, n the East, probably Ceylon, but as the war progressed and resources for the new organisation were in short supply the role and structures of the units planned by the MNAO changed. It was to be late in the summer of 1945 before sufficient materials and resources became available for the MNAO to begin its work in earnest and the Admiralty began to search for a formation and assembly base in the UK. The Admiralty had no suitable sites available so the search turned to the RAF; the Air Ministry proposed Ludham, 11 miles NE of Norwich, not the most suitable candidate but the only one available at the time. LUDHAM was transferred from RAF No. 12 Group to Admiralty charge 24th August 1944, an advance party of the M.N.A.O. arriving to occupy the airfield the day before. he station was commissioned as H.M.S. FLYCATCHER, Royal Naval Air Station LUDHAM on September 4th under the command of CDR (A) J.B. WILSON, Senior Officer Mobile Naval Airfields Organisation (S.N.O.M.N.A.O.). Captain L. J. S. EDES assumed command of R.N.A.S. LUDHAM and the title S.N.O.M.N.A.O., on November 1st 1944. The first Mobile Naval Air Base (MONAB) began assembling within days of Ludham commissioning, assembling along the lines of an earlier trial MONAB which had been assembled at R.N.A.S. Yeovilton in June 1944. Despite short falls in both equipment and manpower availability the second MONAB began to assemble on October 1st. This posed a big challenge to the fledgling organisation as it was decided to the tasking of MONAB II to that of a Receipt & Dispatch Unit, a completely new type of unit not envisaged in the original planning. The originally allocated technical components (Mobile Maintenance and Maintenance Servicing units) were withdrawn and the MONAB was assembled with only Maintenance, Storage & Reserve (MSR) components. The originally drafted compliment of ratings was to be made almost totally redundant by this change of task, a further batch of 997 ratings arrived in due course, this raising the total number of personnel at Ludham to an unacceptable level. To overcome this problem it was decided to split MONAB. 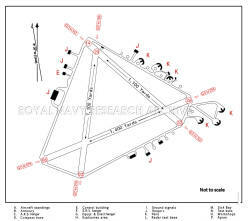 II and to ease the over crowding by sending the technical components, comprising of 600 ratings, to RN Air Establishment Risley, where they would complete assembly. This allowed MONAB III to commence formation on October 18th. All units forming at Ludham faced one common problem, the M.N.A.O. was severely under manned; this was manly a shortage of ratings. To overcome this shortage manpower was poached from the assembling units. Another handicap to the smooth formation of mobile units was Ludham itself; being a fully dispersed airfield spread over a wide area the distance between the Headquarters., forming areas and stores issuing points was very prohibitive, especially in the winter months; in short Ludham was a less than ideal station for the task allotted. MONAB III began to assemble from 18th October, and ten days later MONAB I was complete enough to commission on the28th bearing the ships name HMS NABBINGTON, just before personnel for MONAB IV began arriving on the station at the start of November, ready to began to assembling` on November 15th. MONAB II commissioned on November 18th bearing the ships names H.M.S. NABBERLEY. MONABs I & II departed by road and rail for Liverpool docks during the 18th - 20th of November, for embarkation and passage to Australia. According to the MNAO timetable both units should be fully manned, equipped and worked up by this time, the reality was that both units were missing key personnel, several vehicles, a/c spares, tools, together with many other items of their scale of issue which Ludham was unable to furnish. The stores & equipment of MONAB III were despatched overnight on December 2nd, destined for Gladstone Docks, Liverpool for embarkation. This was in advance of the unit commissioning as H.M.S. NABTHORPE two days later. On December 4th 1944 personnel for Transportable Aircraft Maintenance Yard No. 1 (TAMY 1) began to assemble at Ludham. This unit threatened to pose the same problems as MONAB II and exceeding Ludham's capacity. Although by the time TAMY 1 began to assemble in early December there were only MONAB. IV and the personnel of MONAB III remaining, there would still not be adequate room to house the considerably larger elements of a TAMY. Therefore formation of TAMY 1 was to be split in the same manner as MONAB II, the HQ component formed at Ludham and the technical components at HMS GOSLING. The winter of 1944 also compounded the strain of the day-to-day routines of the assembling units, things inevitably slowed down; ratings were forced to queue for hours in rain, mud and snow for personal kit issues. The large areas of tented accommodation erected to house the personnel became a quagmire. The Admiralty having taken onboard the problems at Ludham began to look for a new site for its MONAB assembly station. Ludham was not ideal from the start, it had poor road and rail links, it was too far from the port of embarkation, and the geography of the station itself was working against it, negotiations were resumed with the Air Ministry to find an alternative site. On December 18th 1944 the personnel and remaining elements of MONAB III left the station for Liverpool docks, their place was soon filled by the arrival of personnel for MONAB V which began to assemble on December 28th. MONAB. 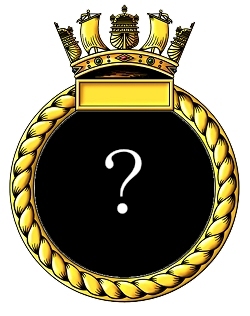 IV commissioned on New Years Day 1945, bearing the ship's name H.M.S. NABARON. On January 11th 1945 a second change in tasking resulted in MONAB V having its component allocation revised, the Mobile Repair components were withdrawn, being replaced with two Maintenance, Storage & Reserve components. The equipment and personnel of MONAB IV were transported to Liverpool for embarkation and passage to Australia on January16th. On February 1st 1945TAMY I commissioned bearing the ships name H.M.S. NABSFORD, and MONAB V also commissioned as H.M.S. NABSWICK. The personnel & equipment of both these units departed for Gladstone docks, Liverpool, on February 16th to embark for passage to Australia. Meanwhile the Admiralty's search for Ludham's replacement had resulted in the Air Ministry offering to swap RAF Middle Wallop for Ludham. The Admiralty accepted because Middle Wallop better met the requirements of a MONAB formation & despatch station, it was more centrally located, had better road & rail links and its layout was of a more conventional type. H.M.S. FLYCATCHER paid off at R.N.A.S. Ludham on February 16th 1945. The M.N.A.O. transferred to R.N.A.S. Middle Wallop, the station being transferred from No.7 0 Grp. RAF to Admiralty control the same day, and commissioned as H.M.S. FLYCATCHER. Drury, A.J., (2000 - 2019) 'The MONAB Story' - A history of the Mobile naval Air Bases of the Royal Navy.